All I want to do is squeeee and gush and tell you to READ THIS BOOK! I'll try to contain myself. You may already know that I'm a big fan of historical fiction. I'm always on the lookout for a book that can take me back in time. It's been a long while since I read a smashing good royal historical fiction. Until now. 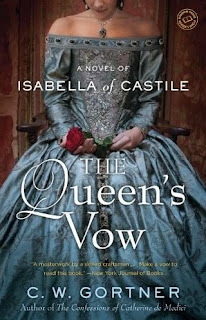 The Queen's Vow is about Isabella of Castile. You know Isabella. She's the gal that sponsored Columbus's voyage to the New World. If that's all you know about her you are missing out. I've read other accounts of her life. She's been painted as the cruel queen behind the Spanish Inquisition. There is so much more to her story. Her motives for supporting the Inquisition aren't as cut and dried as it would seem. Gortner did his research and he clears up many misconceptions. Isabella was a women who took matters into her own hands. She married who she wanted to in a time when that was slightly frowned upon. She took control of a country that was in the hands of crooked noblemen and under constant enemy threat. She fought for her beloved country, she fought to retain her crown. She was a strong, fascinating woman. C.W. Gortner brings Isabella to vivid life. His rendering is lush, opulent, and absolutely scrumptious! I'll say it again: READ THIS BOOK. Beware Mr. Gortner, you have a new FANGIRL! To visit the rest of the stops on this tour please see the schedule at Historical Fiction Virtual Book Tours. Must try! This one sounds awesome. I've discovered I quite like historical fiction, but I've only ever read Philippa Gregory and Alison Weir. Maybe it's time for me to transition from English kinds and queens to Spanish ones. I went through a Tudor phase that lasted for about...oh 100 years or so ;) It was wonderful to learn about a different royal family! I don't know enough about Isabella, this book seems like a good place to start! This is a GREAT place to start. I didn't know enough about her, what a woman!! I read Gortner's THE LAST QUEEN for TuesBookTalk some time ago and really enjoyed it. I've been meaning to read more of his books--I'll read this one for sure. Well, you got my attention with C.W. Gortner's name! 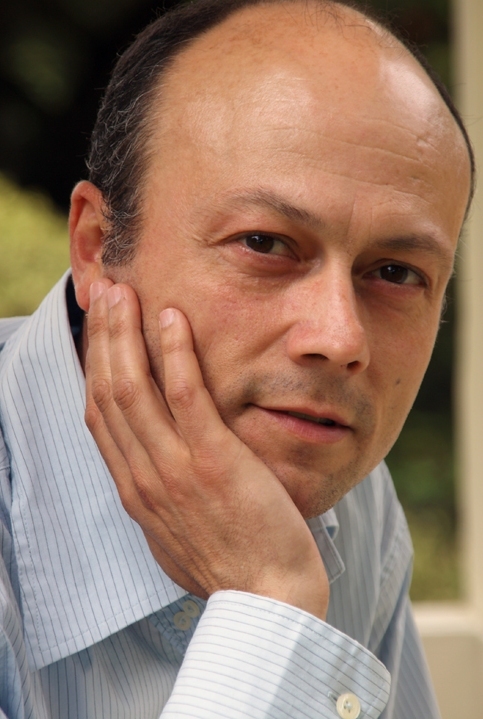 He is one of my favorite historical fiction writers, and I love historical fiction. Lately, I've not read a lot, so nice to know there's a good one out there waiting for me. He's a new discovery for me! Hooray! This sounds so absolutely lovely! I'm in the "funded Columbus and...." camp when it comes to Queen Isabella, but she does sound so absolutely interesting! It looks like this novel was just published, but I feel like I read it several years ago. Did this author write another book about Isabella? Is this a sequel? I see that the author answered this question below ;) It was recently released in paperback. Thanks so much! I love this review, made me laugh - not a common event while on tour. In answer to Quirky's question, this is the paperback release of the hardcover, which was published last year, not several years ago. As far as I know, it's the first novel on Isabella to appear in English in over 20 years. I'm so glad I made you laugh! It was my pleasure to read and review your book and I can't wait to read another :) Thanks a million for visiting!! Sounds like a great book about a fascinating subject. I'll be checking it out. Thanks for the review! Yes and yes! :D I hope you do, it's a great one! I am a fan of C.W. Gortner and this book was great. Nice review! You know I can't resist a good piece of historical fiction and you definitely sold this one! I love all the history around the Spanish Inquisition, too. Looks like another one to add to Mt. TBR! I love historical fiction, so this one will come on my list of books I want to buy. Thanks for the very enthusiastic review, love it! I'm going to be on the lookout for this one! I went through a phase of those years ago and I think I read every decent one out there, lol. It had been a long time and I'm glad I re-started with this one! Okay, okay, I'll read it!! Ha ha! That's right!! You should!! LOL I saw that it was historical fiction and thought, she is probably flipping out over this book!!!!!! :) :) :) Glad it didn't disappoint! Ha ha, you know me! ;) It didn't disappoint at all, hooray! I will absolutely be reading those!! :D Hooray! Then this is definitely a must read if you have to say it twice! Sounds awesome, Jen! It really is, I promise :D It was RIGHT up my alley! This one sounds interesting! I don't read much historical fiction, but I should try to mix up my selections a bit (particularly right now because I'm in a bit of reading slump).